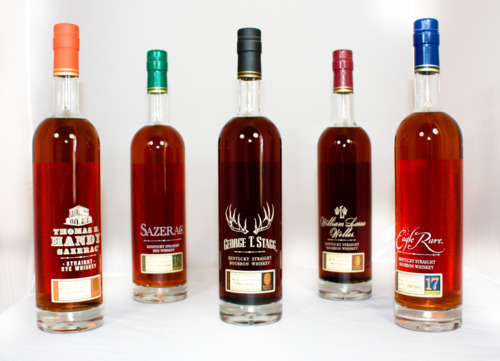 Every year, Buffalo Trace Distillery in Frankfort, Ky., releases an Antique Collection featuring limited-edition whiskeys of various ages, recipes and proofs. The 2011 collection is scheduled to arrive in stores sometime in mid-October, but the Bourbon Babe was lucky enough to get an early sampling of the five offerings selected by master distiller Harlen Wheatley, who surely has one of the greatest names in bourbon. Verdict: “Some bold stuff,” Buffalo Trace says of this bourbon, and that’s for sure – almost too bold for my tastes. The alcohol is so intense it just about overpowers the flavors. I enjoyed this one much more after adding a splash of water. The 2010 release of the George T. Stagg was named “Spirit of the Year” by Spirit Journal’s F. Paul Pacult; I’ll be watching to see what he thinks of the 2011. Aroma: Lots of caramel and toffee, and you can nose this one without searing your sinuses. Taste: More caramel and toffee; sweet, but with an odd discordant sour note in the middle. Verdict: Weller is Buffalo Trace’s wheated bourbon, which makes that sour note even odder. At 133.5 proof it has some burn, but nothing like the Stagg. Aroma: Vanilla, leather – a lot like a leather jacket, actually. Taste: Vanilla, tobacco. A dry, short finish. Verdict: A very nice bourbon, one to savor. Overall verdict: The George T. Stagg would be a good choice for toasting a special occasion, but it’s just too intense for casual sipping. For that, I’d choose the Eagle Rare. I like wheated bourbons, but the Weller was my least favorite of these three. We tried a beer brewed in a whiskey/bourbon barrel. Best beer ever, I’d rather drink bourbon anyway. Is the biggest difference between Jack Daniels and say Maker’s the type of wood or content of the mash.